High-quality materials and installation best practice are two key ingredients for creating a floor and underfloor heating system which exceeds expectations. We use a 1200-gauge, single wound polyethene membrane on top of the substrate and a 500-gauge alternative above the insulation boards, because they provide the best water-proof protection for your new floor. The high quality membranes we use aren’t folded in storage, which makes them quick to install. We offer Radon Gas membranes too for customers living in high-risk areas of the UK. Installation standards are important to us, which is why we always install a 10mm perimeter edging strip to allow for expansion, contraction and cold-bridging for external walls. 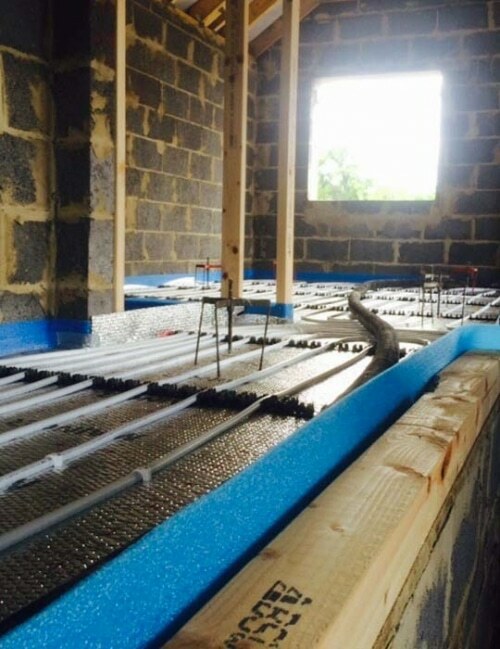 Many screeding contractors will skip this important installation step, which can leave your new floor at risk of damage and failure. As an established business, we benefit from considerable bulk-buying discounts with reputable manufacturers. This means we can purchase the best materials for our installations at a much lower cost. Find out more about the products we use here.